To stimulate the development of the aviation, the Cuban government April 24, 1947 by Decree 1150 suspends the collection of all the taxes that gravan the gasoline of aviation that be employed in Cuba to supply the airships dedicated to the international service. March 13, 1950 by Decree 926 was created the Council of Civil Aeronautic integrated by the Prime Minister of Government, the Ministers of State and Communication. The prosperity of the postwar time and the great American surplus quantity of equipment to good price, permit that they multiply the air services. In October of 1945 another Cuban air line is constituted, the Aerovías Q, with a capital of $1,110,000.00, founded by the Colonel Manuel Quevedo. In September from 1946 the company Aerovías Q establishes flights of passage and cargo among Havana, Cuba and Key West, Florida. Little later, in November 24, 1946, was made the first flight of a Cuban commercial company to Spain, carried out by the airplane "Route of Columbus" of Aerovías Internationales, with the DC-4, registered NC-567. But little later, February 6, 1947 this airplane "Route of Columbus" is destroyed totally when shattering in a point situated to 1,400 meters of height, among the risco of the Friar and the risco of the Flores (Province of Avila, Spain). July 20, 1946 is founded the Corporación Aeronáutica Antillana S.A., with three Avro Anson, a Stinson and a Beechcraft, that does smaller flights betwen the sugar fabrics. August 16, 1948 is created Cuba Aeropostal, for flights of load with two airplanes C-47 and 4 Curtiss C-46. It counts on a authorized capital of $400,000. This company begin the May 3, 1949 its operations with its 6 equipment, since the military field of aviation Columbia, in the routes Havana-Miami and Havana-New Gerona, Isla de Pinos. In the postwar time Cubana establishes in autonomous form international routes, operating to North America and Europe. At May 15, 1946 with the increase of the number of airplanes DC-3 of Cubana, the service is inaugurated Havana (Cuba) - Miami (U.S.A.), in daily flights of departure and returns, in his first international route. In domestic routes are used the DC-3 and the C-46 Commando. In 1947 this flight Havana - Miami was enlarged to the number of three dailys flights, and in this year they began to planified the flights over the Atlantic. In June 17, 1948 is inaugurated the service Havana - Santiago of Cuba with DC-3. And in July of 1948 follows it the Santiago of Cuba-Port au Prince (Haití) with equipment DC-3. Then April 26 1948 Cubana de Aviación carries out the first flight over the Atlantic Havana-Madrid with the DC-4 CU-T188 "Star of Cuba". Significant event for the history of Cubana. The same one "Star of Cuba" returns May 5, 1948 in the first flight Madrid-Havana of Cubana. This airplane has a tragic accident April 26, 1951, collisioned by an airplane of the U.S. Navy near Key West, Florida. Cubana in 1950 substitutes the equipment DC-3 by the DC-4 in the route Havana - Miami, being duplicated thus the availability of seats by flight. In this same year, the Postal Union of the United States granted Cubana the contract for the Air Postal Service. In the same 1950 year the Counsel Interamericano of Security offers Cubana a special prize by to not have had fatal accidents since its foundation in 1929 (21 years without fatal accidents!) Cubana has too the world record in passengers traffic increment. 2 of April of 1950: First flight Havana-Rome of Cubana de Aviacion, "The route of the stars" with equipment DC-4. 16 of August of 1951: First nocturnal flight Santiago-Havana to the vanguard of the air service with airplane DC-3. In this period the Cuban civil aviation enlarges considerably its volume of operations and the state establishes the corresponding mechanisms. May 2, 1952 is created the General Direction of Air Transportation by Decree Law N° 41 and December 22, 1954 creates the Commission of Aeronautic Civil, by the Decree Law N°1863. In the1954 year the Pan American Airways yielded to the Cuban businessman the 20% of the actions that retained, and then Cubana de Aviación stopped being a subsidiary of Pan American World Airways. The majority of the actions are bought for a group of Cuban businessman, represented by the Mr. José López Vilaboy. 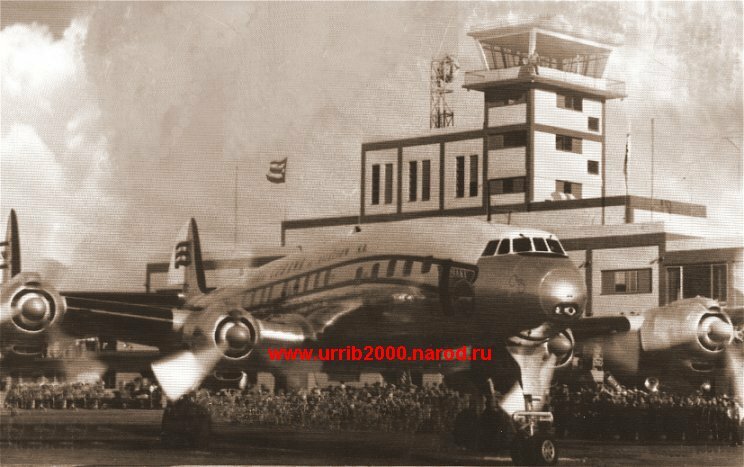 In 1953 Cubana inaugurates several routes and new equipment: January 23 the route Havana-Varadero, June 15 the first flight Havana-Madrid in a Lockheed Constellation L-1049G (the CU-T532, piloted by the Captain William Cook and the first official Guillermo González Vizcay). The 17 of setiembre opens the new route Havana - Mexico with the four-motor Constellations and in November 28 the route Havana- Port-au-Prince (Haití). They substitutes the equipment DC-4 by the L-049 Constellation in the services Havana - Madrid and Havana - Miami. October 14, 1954 Cubana de Aviación acquires the first position for the purchase of the first one Lockheed L-1049E Super Constellation, being becoming the first company in acquiring this equipment. November 22, 1954 Cubana receives a L-1049E Super Constellation, registered CU-T573. With this airplane improves the service over the Atlantic, and the Constellation alternated in the routes Havana - Mexico and Havana - Madrid (Spain). The modernización of Cubana continues with the acquisition February 20, 1956 of 3 airplanes Lockheed L-1049G Super Constellation. These airplanes March 5 1956 carry out the first flight Havana-Madrid and in May 12 1956 they inaugurate the route Havana- New York. Also this year Expreso Aéreo Interamericano operates 3 cargo airplanes C-46 since the Airport José Martí (Rancho Boyeros) in Havana, to Miami, Florida. Cubana has in 1958 15 airplanes. December 22, 1958 Cubana acquires 4 new airplanes Bristol Britannia BB-318 "The Whispering Giant" and employs them in its route Havana City Mexico. A finales de 1952 Cuba Aeropostal adquiere dos C-46 de carga para su ruta Habana-Miami. En diciembre 1957: Aerovías Q adquiere dos DC-4 de pasajeros para la ruta Habana-Key West y Habana-West Palm Beach. At ends of 1952, Cuba Aeropostal acquires two cargo C-46 for its route Havana-Miami. In December 1957: Aerovías Q acquires two passengers DC-4 for the route Havana-Key West and Havana-West Palm Beach. 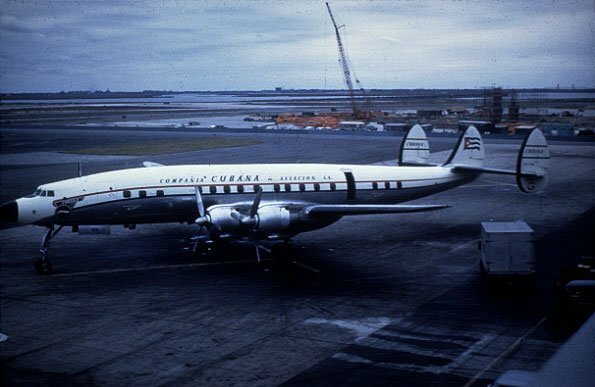 December 6, 1952 the DC-4 registration CU-T397 "Estrella de Oriente" ("Star of East") of Cubana de Aviation, suffers a fatal accident in the Bermudas. May 25, 1956 is inaugurated the International Airport "Antonio Maceo" in Santiago of Cuba, province of Oriente, Cuba. In 1956 Cuban receives prize for 16 years of operations without fatal accidents and during the decade of the 50, has world records in the transportation of passengers. To end of the 50 the flights to Miami were called "flights of supper", because they arrived at Miami in the afternoon and they brought to Havana tourists to have dinner and to stroll for the nocturnal clubs of the Cuban capital and then they were collected to following the morning of return to Miami. PAN AMERICAN AIRWAYS in 1958 bound Havana with Miami, (approximately 8 daily flights), with Mérida and with El Salvador, operating with airplanes Douglas DC-4, DC-6 and DC-7. Besides it performed flights since Camaguey to Miami and toward the south, Jamaica, Venezuela and other countries. MEXICANA OF AVIACION, subsidiary of Pan American, operated among Havana, Mérida and Mexico, 4 times a week with the same equipment as the PAA. DELTA AIRLINES connected toward the north Havana with New Orleans and Chicago, and toward the south with Montego Bay (Jamaica) and Caracas. Also it flew since Havana to Port-au-Prince (Haiti), Ciudad Trujillo (Rep.Dom), and San Juan, Puerto Rico. It operated with Convair 440 and Douglas DC-7. BRANIFF AIRWAYS bound Havana toward the north with Texas and other states of the United States and toward the south with Panama and other countries of South America, as Equator, Peru, Colombia, Argentina and other, with airplanes Douglas DC-6. AEROPOSTAL VENEZOLANA S.A. Operated among Miami-Havana-Caracas with equipment Super Constellations. KLM, The Royal Dutch Company, flew among Miami-Havana-Curazao, with equipment DC-6 regularly, and to times with DC-7, although this last utilized it more in the route Havana-Montreal-Europe. AEROLINEAS ARGENTINAS that connected New York with Havana, following toward the South to Trinidad, Sao Paulo, Rio of Janeiro and Buenos Aires with equipment Douglas DC-6. IBERIA, Spanish Airlines, that competed with Cubana in the same route Havana-Madrid, with equipment Super Constellations. 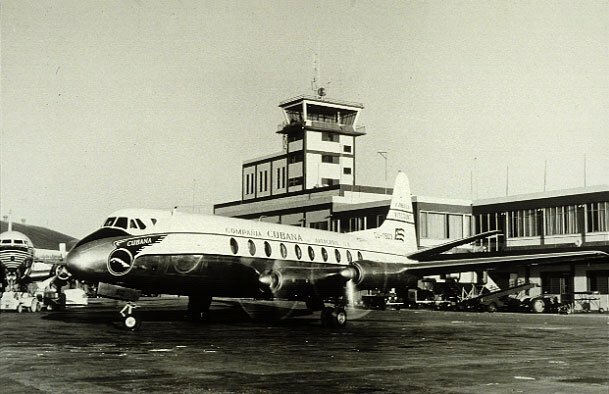 LACSA, Costa Rican Airlines, subsidiary of the Pan American, that communicated Havana with San José de Costa Rica and other cities of Centroamérica as Guatemala, with equipment Convair 340, mainly. TAN, National Air Transports (Honduras) that bound Havana with Centroamérica with airplanes Curtiss C-46. ALA, Air Transportats of Chile, that in 1958 began to operate irregularly a passengers line of among Santiago de Chile and Havana, with scales in Peru and Panama, utilized the Douglas DC-4. MAKEY AIRLINES that inaugurated its passengers line of among Ft. Lauderdale, Florida and Havana, Cuba, operated airplanes Douglas DC-4. NATIONAL AIRLINES that in 1958 flew daily in the route Havana-New York and Havana-Miami, operated with equipment Douglas DC-6 and DC-7 and Convair 340 and 440, respectively. Source: "La aviación civil en Cuba" ("The civil aviation in Cuba"), of Martín Socarrás Matos, Editorial of Social Sciences, Havana, 1988, pages 42-44.